​With NBA championships in his final six full seasons with the Chicago Bulls, Michael Jordan was more than the biggest winner of the modern era – he was also the leading scorer, as well as the richest and most popular star. Jordan was the alpha and omega of the NBA’s unanticipated rise to prosperity in the 1990s. And then, at the height of his influence, Jordan retired after making his final shot to win the 1998 NBA Finals. By then the NBA’s commercial sponsors and media companies were already obsessed with finding a replacement for Jordan. Over the dozen years that followed Jordan’s retirement, every young star was compared to Jordan, and none of them could pick up where Jordan had left off. His enduring example haunted them and their league. The first star to be identified as a successor to Jordan was Kobe Bryant. Legal troubles, the breakup of his championship partnership with Shaquille O’Neal and other controversies prevented Kobe from replacing Jordan in terms of commercial popularity. While Kobe was never going to be what Jordan had been off the court, he did have a chance to rival Jordan on the court. Kobe would uphold the NBA’s competitive values in the years following Jordan’s retirement. As much as Jordan coveted money and fame, his fans recognized that competing for championships was his ultimate priority. The same was true for Kobe: While seeking a third straight championship for the Lakers in 2010-11 – and a sixth championship overall, which would have stood him equal with Jordan – Kobe forced teammates and opponents alike to match his ruthless standard. Those rivals included LeBron, who was more gifted than Kobe and yet not nearly so accomplished. ​When LeBron was a 16-year-old high school junior in Akron, Ohio, he was featured on the cover of Sports Illustrated magazine as ``The Chosen One.’’ He was the young star most likely to inherit Jordan’s kingdom, and LeBron embraced that destiny by having THE CHOSEN ONE tattooed across his upper back. By 2010, however, LeBron had failed to win a championship in seven seasons with the Cleveland Cavaliers, his hometown team 45 minutes north of Akron. His postseason losses had much to do with the absence of talent around him, which compelled LeBron to sign with the Miami Heat alongside fellow stars Dwyane Wade and Chris Bosh. There was a constructive argument to be made on his behalf – but LeBron undermined his own message by way of his self-destructive appearance on The Decision, the reality show he created to exploit the attention he was receiving as a free agent. The would-be savior of the NBA was recast overnight as the villain, and it was because LeBron appeared to have lost his way. He was accused of withering in the biggest moments, and of tending to his off-the-court ambitions (as crystallized by The Decision) at the expense of his fulfillment on the court. In Miami, with the help of team president Pat Riley, LeBron would need to redefine his priorities if he was ever going to become the champion he was meant to be. LeBron James and Dirk Nowitzki seemed to approach each other from opposite ends of the basketball world. LeBron was an American prodigy who grew up hearing that his greatness was assured; for Dirk, a German, basketball was a second language, and all too often he doubted whether he could compete with the best. While LeBron was arguably the most gifted player in NBA history, Dirk’s talent for shooting and scoring was hammered into him via meticulous workouts choreographed by his mentor Holger Geschwindner. LeBron was the NBA’s biggest commercial star. Dirk had little interest in pursuing endorsements. Dirk was driven by a sense of humility that is common among immigrants to America. Having lost his first championship opportunity in 2006 – when his Dallas Mavericks were upset by the Miami Heat – all Dirk wanted was another chance. If he could find his way back to the NBA Finals, he was not going to let his dream slip away again. By focusing on the universal point of view that enabled an immigrant to challenge the greatest Americans at their own game, The Soul of Basketball becomes the first mainstream book meant for the NBA’s global audience. It is for Americans and non-Americans alike. Glenn "Doc" Rivers, the son of a tough Chicago cop, grew up believing in the traditional values of the Boston Celtics long before he became their coach. His job, as he saw it, went deeper than drawing up plays to free up an open jump shot. He set out to strengthen his players by drawing from his own life experiences, from the history of civil rights, and from the shared dreams that unite all Americans. ​The more he succeeded in mentoring players like Paul Pierce and Rajon Rondo, who had been raised without fathers, the more gratitude Doc felt for his own upbringing. In 2010-11, Doc’s elderly team of Celtics was galvanized by the audacity of the Miami Heat, whose younger stars – led by the newly-signed LeBron James – were acting as if they had won the championship already. In order to teach LeBron a lesson, the Celtics were going to need leadership from their young point guard Rondo. Was he up to the challenge? The 1980s was the NBA’s golden generation, when Magic Johnson, Larry Bird, Isiah Thomas and Michael Jordan competed annually for the only trophy that mattered – and their spiritual godfather was Pat Riley. As the magnetic young coach who drove the Los Angeles Lakers to the NBA Finals in seven of his first eight seasons, Riley persuaded his players (as well as their opponents) to set aside their rewards in order to prioritize the hard work of winning championships. Wealth and fame were important goals, Riley well knew, because he valued them himself; but winning had to come first. Now, as president of the Miami Heat, Riley was formulating plans to recruit the NBA’s most promising star to South Beach, in hope of instilling in LeBron James the same devout approach that had brought out the best in Magic Johnson a quarter-century earlier. But prosperity had changed the NBA, and in this new era of free agency LeBron had more leverage than any player in league history. He was also more in need of structure and discipline than the stars of previous generations, who were accustomed to hard coaching. Would he conform to Riley’s timeless method? How badly did LeBron want to become a champion? A decade before LeBron faced The Decision, 24-year-old Tim Duncan was on the verge of leaving the San Antonio Spurs as a free agent. Unlike LeBron, Duncan was drawn to re-sign with his small-market franchise by his relationship with coach Gregg Popovich – who was the mentor that LeBron never had. When Duncan committed to the Spurs in 2000, Popovich rebuilt the roster in Duncan’s image by pursuing players from around the world. Future stars like Tony Parker of France and Manu Ginobili of Argentina were in many ways like Duncan, who had been raised in the U.S. Virgin Islands far away from the AAU culture. San Antonio became the only small-market team to win NBA championships in the modern era by distancing itself from the commercial influences of American basketball. The team-first approach of the Spurs’ international stars enabled them and their coach to create an environment of brutal honesty, as Popovich explains in The Soul of Basketball. When the young internet billionaire Mark Cuban bought the Dallas Mavericks in 2000, he was already well-known among Dirk Nowitzki and the other players. Cuban was the loudmouthed fan sitting courtside who endlessly criticized opponents, referees and the Mavericks themselves – and now he was going to be in charge? Their worst fears gave way to a dream come true as Cuban transformed the losing franchise into a championship contender. Cuban applied his entrepreneurial point of view to reinvent the Mavericks from the ground up – spending lavishly and wisely to upend the traditional model of basketball management. Throughout their first decade together, the Mavericks’ biggest personality was their brash, controversial owner. As they entered the 2010-11 season with an expensive roster of elderly stars fast running out of time to win the championship, the question was whether Dirk could take on leadership. The upstart billionaire had created an outside-the-box team for the NBA’s most humble franchise star – now it was up to Dirk to finish what Cuban started. The final Celtic star to have a meaningful relationship with franchise patriarch Red Auerbach was Paul Pierce, who had arrived to Boston in 1998 as the No. 10 pick of the draft (one spot behind Dirk Nowitzki). Pierce spent his first NBA decade learning how to become a team-minded Celtic, based on the teachings of coach Doc Rivers prior to the arrival of future Hall-of-Famers Kevin Garnett and Ray Allen. After winning the championship as NBA Finals MVP in 2008, and losing Game 7 of the NBA Finals two years later to Kobe’s Lakers, a new source of inspiration appeared before Pierce. LeBron, his longtime rival at small forward, had taken his talents to South Beach while declaring how easy it would be for the Heat to fulfill their championship potential. Pierce and his teammates were offended by Miami’s unearned arrogance. Boston’s elders set out to teach the upstarts a lesson on Celtic Pride – with the help of a young, athletic star from LeBron’s generation. Pierce was counting on 24-year-old point guard Rajon Rondo to show leadership. Were the Celtics asking too much? In the cultural tradition of Moneyball and Friday Night Lights, award-winning sports writer Ian Thomsen portrays the NBA as a self-correcting society in which young LeBron is forced to absorb hard truths inflicted by his rivals Kobe Bryant, Doc Rivers and Dirk Nowitzki, in addition to lessons set forth by Pat Riley, Gregg Popovich, Larry Bird, David Stern, Joey Crawford and many more. 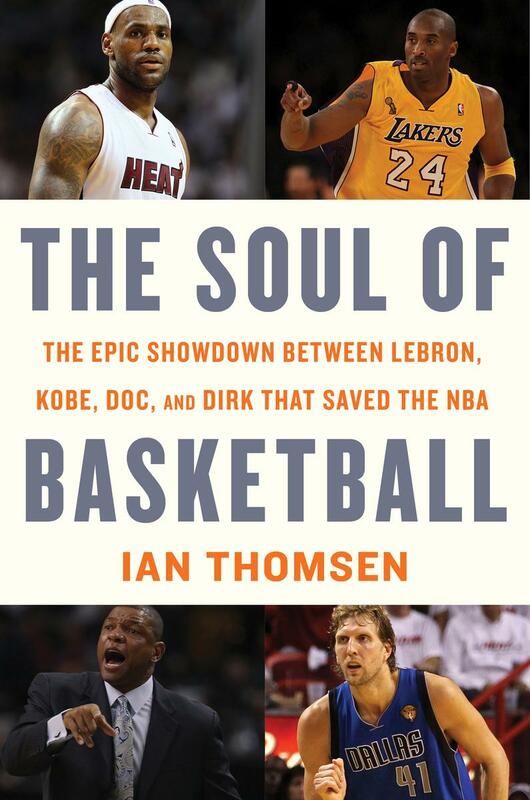 ​Ian Thomsen's book on the breakthrough 2010-11 NBA season is available via all major online book sellers, both in hardcover and in digital editions.